It is time to recognize the accomplishments of Curt Flood, the athlete who has had the greatest impact on sports during the past 50 years. NEW YORK (CNNMoney.com) -- I know we've got enough holidays already, especially this time of year. But Nov. 25 should be celebrated as an Independence Day of sorts, at least by professional athletes ... and probably their fans as well. That's the now forgotten day that baseball player Curt Flood changed sports in this country more than any athlete since Jackie Robinson. It can be argued that Flood paved the way for the era of free agency in professional sports. 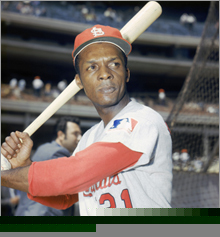 Curt Flood's battle to create free agency is documented in a new book, "A Well-Paid Slave." On Nov. 25, 1969, Flood, who had been an All-Star center fielder for the St. Louis Cardinals, met with Marvin Miller, the executive director of the Major League Baseball Players' Association, as well as the union's attorney, and told them of his intention to sue Major League Baseball. Flood wanted to challenge the legality of baseball's reserve clause, which essentially tied players to their team forever. Flood, who had endured Jim Crow discrimination and worse playing minor-league ball in the South in the 1950s, was angry that the Cardinals could trade him to Philadelphia without him having any say in the matter. Written by attorney and former baseball writer Brad Snyder, it tells of how the battle with Major League Baseball left Flood a broken man in many ways, suffering from alcohol abuse and financially destitute. Flood sat out the 1970 season rather than accept the trade and played briefly for the Washington Senators in 1971, before retiring. Still, Flood came closer to winning his legal battle than most experts, including Miller, imagined he would. The Supreme Court narrowly rejected his challenge in 1972. As the book details, it might have been successful if one sympathetic justice, Lewis Powell, hadn't had to sit out the case because of his ownership of Anheuser-Busch (Charts) stock. The brewer also owned the Cardinals at that time. Miller told me this week he hadn't been looking for someone to challenge the rule legally, as he believed that was the most difficult course to get rid of the reserve clause. But Miller and Snyder both believe Flood's legal fight was a major turning point in the union's efforts to get rid of the reserve clause. Management had agreed in 1970 to use an independent arbitrator to settle future disputes with the union while Flood's case worked its way through the courts. The reserve clause was finally thrown out by that arbitrator on Dec. 23, 1975. "The question is, without the lawsuit, how much longer would it have taken to get impartial arbitration of grievances," Miller told me. "Once we had that, it was only a question of a year or two before we were able to get rid of the reserve clause." Snyder believes Flood's case was critical in turning public opinion, and even the opinions of some of the game's stars at that time, about the rights of athletes to be free agents. "You can't connect the dots, and point to how the legal fight led to free agency," said Snyder. "But he changed the temperature of the public opinion." Free agency brought millions to players. Even adjusted for inflation, Flood's $90,000 salary in 1969 would be less than $479,183 in today's dollars. That's about a fifth of the league average for players today and a small fraction of what players of his caliber get paid currently. In fact it's close to the major-league minimum pay of $400,000 that goes into effect in 2009 under the new labor agreement. It's an indication of how underpaid the players were then but also an indication of how little the owners were doing to improve the popularity and revenues of the game. Today, despite much bigger salaries, baseball is enjoying its greatest profitability and popularity. Snyder, who was born after Flood's last game, never got to talk to his book's subject before he died in January 1997. Miller, of course, talked to Flood often. He said Flood was torn between feeling broken by his fight and feeling he was the ultimate victor. "It really depended upon when you talked to him," Miller said. "There were periods when he was profoundly discouraged, and other periods when he was justifiably proud of what he had done." He certainly gave up some productive years at the end of his career, but he left a legacy for the game greater than that of just about any other star who played at that time.